The tombstone for former Mayor Ed Koch, who died in February after meticulously planning the details of his burial for years, was mistakenly engraved with the wrong birth date, NBC 4 New York has found. The marker, which stands more than 5 feet tall and 6 feet wide, lists Koch's birth date as Dec. 12, 1942, instead of 1924. The birth date on the headstone would have made him a child during World War II, even though the inscription notes he served in the armed forces during the war. Koch, New York City mayor from 1978 to 1989, was buried in Trinity Church cemetery in Washington Heights after his death from congestive heart failure at age 88. The funeral was attended by top dignitaries, and featured remarks by former President Bill Clinton and Mayor Michael Bloomberg, among others. The headstone mistake is particularly poignant because Koch so carefully planned his burial years before his death. In 2008, Koch revealed he had bought the plot at Trinity so that he could remain in his beloved borough for eternity. "I don't want to leave Manhattan, even when I'm gone," Koch said at the time. His former chief of staff, Diane Coffey, said at his funeral that he had begun preparing for his death in the 1980s. "Who else plans every detail of a burial?" she said. 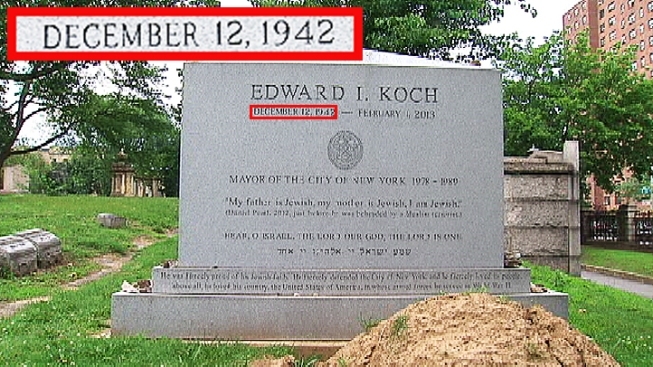 The marker did not have the birth date engraved on it when Koch was buried. Tommy Flynn, of Flynn Funeral and Cremation Memorial Services, told NBC 4 New York the dates were engraved earlier this month, and the mistake was "an inadvertent error." Flynn said he feels "terrible." "I have to make it right. I will correct it," he said. Coffey told NBC 4 New York on Monday that she was "appalled" to hear of the error, but also said Koch might have found humor in the mistake. "As Ed Koch used to say, 'It's always important to correct the record,'" she said.